If you haven’t been following the “Rockwool” story, don’t worry…I hadn’t been either until very recently, when I saw politicians and activists starting to weigh in heavily. What’s the “Rockwool” story, you ask? In short, “Rockwool” is “the world’s leading manufacturer of stone wool insulation.” The company, which is based on Denmark, has “3 factories and 800 employees.” According to the company’s website, “In 2017, The ROCKWOOL Group and ROXUL announced the second expansion into the USA. This over $150 Million US investment will see 460,000 square feet of manufacturing on a 130 acre, adding to the already strong presence in North America, and create 150 new jobs within Jefferson County.” That plant, a few miles west of Harpers Ferry and Loudoun County, is being heavily contested right now by concerned citizens, including a 500-person protest yesterday (see video, below). For some more background on this issue, see: EXCLUSIVE: Loudoun Co. supervisor chair opposes new Rockwool factory in nearby W.Va., Rockwool: Insulation Plant’s Impact on Loudoun ‘Non-existent’, Exclusive: Amid furor, president of new W.Va. factory vows safe air quality, Hundreds turn out at Sam Michaels Park to protest Rockwool insulation plant, Rockwool addresses emissions; Residents respond, hiss at Ranson, W.Va., City Council meeting, etc. 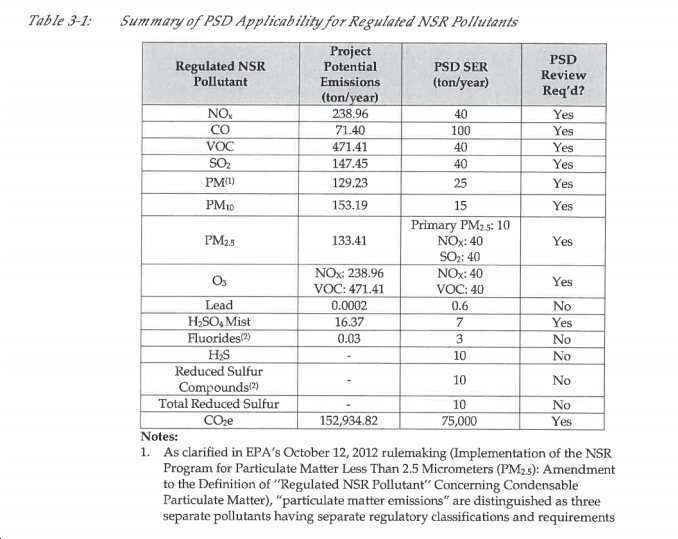 Also see here for Rockwool’s permit application to the West Virginia Department of Environmental Protection “to construct a new mineral wool production facility in Jefferson County, West Virginia.” I took a screen shot, which you can see below, that shows the amount of pollution that the company anticipates will be released from the new plant (around 154,000 tons per year of CO2, plus 471 tons of Volatile Organic Compounds, 239 tons of NOx, 147 tons of SO2, several hundred tons of particulate matter, etc.). 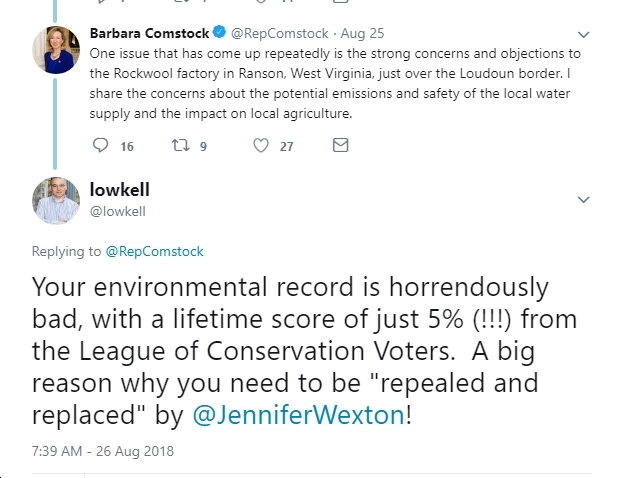 Finally, see below for statements by area politicians, including VA-10 Democratic nominee State Sen. Jennifer Wexton and Rep. Barbara Comstock (who, as I note, has a horrendous environmental record, so that any statement she makes on this is clearly just pandering for the current election, just like her ridiculous claim to be an “independent voice,” even as she has voted 98% with Trump). With that, I’m curious what you all think about this proposed plant. I’m also fascinated by the large-scale interest in this, including thousands of concerned citizens joining Facebook groups and/or attending protests in just the past few weeks. Any thoughts on that level – and intensity – of interest, particularly relative to other environmental issues (e.g., the proposed Atlantic Coast and Mountain Valley Pipelines)? I’m very curious what is driving people on this, because clearly this one has touched a nerve!